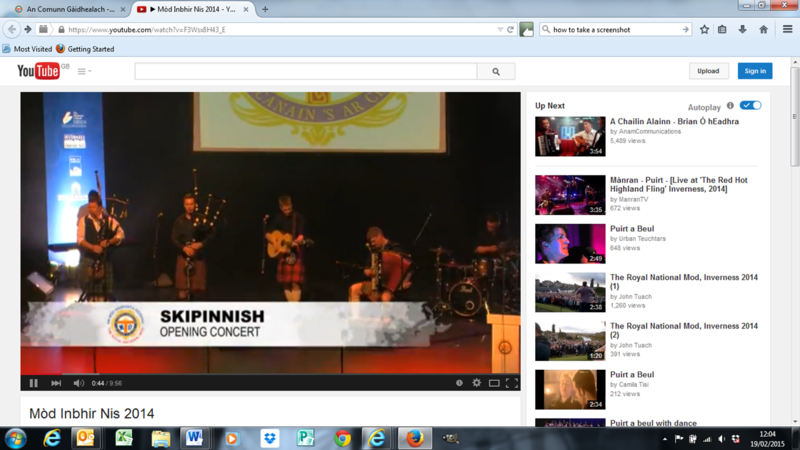 Just a taste of some of the best bits of the Inverness Mòd Fringe, 2014. One of the biggest and most diverse Mòd Fringes ever witnessed with fine hospitality, Gaelic music and song…a great time had by all! The report, delivered by ‘The Market Specialists’ shows the nine day festival, which took place from 10-18 October2014 in Inverness, entertained over 9000 unique visitors, 78% of which came from outside the host city. 67% were in Inverness with the sole purpose of attending The Mòd, while 25% lived in the Highland Capital. Organised by An Comunn Gàidhealach, the event is the most significant of the Gaelic language in Scotland. The figures are testament to The Mòd’s importance, not only to Scotland’s cultural calendar but to its economy too, as 74% of attendees revealed they would not have taken a trip during that week, had it not been for the festival. The Mòd is hosted in a different town or city every year and this is to not only engage more people in Gaelic culture, but also to boost the local economy. Findings from the 2014 festival show there was huge return on Highland Council’s investment in the event, with £19 spent for every £1 invested in their governing area and this rose to £25 for every £1 invested at a local level. The 2014 festivities were a signature event of the Highland Homecoming celebrations and saw the return of Inverness as a host area after 17 years; and its impact was unprecedented. The city’s hotels, restaurants and shops benefited with 60% of attendees staying in a hotel, guest house, rented accommodation or hostel with the average length of stay for overnight guests being 4.2 days. 62% of festival goers reported going shopping at least once (25% on “most days”) while 59% visited pubs at least once (24% “most days”) and 86% ate out at least once (55% on “most days”). The atmosphere saw 61% say the “buzz” of the festival was “well above” or “above” expectations and 59% said Inverness as a host city was also as impressive, with the same percentage indicating that they would definitely come to the city for a future holiday/short break, another 16% said they would possibly do so. Says John Morrison, chief executive of An Comunn Gàidhealach: “We are absolutely delighted with this report, especially as it unveiled 37% of attendees are learning or want to learn Gaelic and we want to see that figure grow. “It confirms the value of the event and the return it can have for host cities, other funders and commercial sponsors - their support is hugely valued and we need it to continue. This return may have been even greater had we received additional funding and we look forward to over-coming the obstacles that make it difficult for, in particular, Creative Scotland to financially back The Mòd, as we have never managed to secure their support. “I must take this opportunity to thank Highland Council, together with our loyal sponsors, our local organising committee in Inverness and all our volunteers who worked so hard to make 2014 so special, but thanks especially to everyone that came to compete and attend our events - here’s to Oban in 2015, I look forward to seeing you all there”. The Mòd 2015 will take place from 9th – 17th October in Oban and is now in its 123rd year. The Provost of Inverness, Councillor Alex Graham said: “We were delighted to host the 2014 Royal National Mod in Inverness. The outstanding success of this world class event clearly demonstrates the economic benefits of Gaelic as well as highlighting the hugely important cultural and heritage impact for the Highlands. Inverness is an ideal location for national events and festivals due to its welcoming nature, its connectivity, its excellent accommodation and hospitality and the flexible range of venues we can offer. This report reinforces the Highland Capital’s capacity to host national and international events and we will work to attract many more to the Highlands. “We are very pleased that the public and the Council’s support generated significant income for the City. This has benefitted accommodation providers, restaurants and shops and also increased the footfall in various venues during what is traditionally an off-peak time in the season. It is also important to highlight that the Mod generated extensive and positive national media coverage for the City and surrounding area. In 2014 The Royal National Mòd was supported by Highland Council, HIE, Caledonian MacBrayne, Bòrd na Gàidhlig, EventScotland, the Royal Bank of Scotland, SQA, BBC ALBA, the Scottish Government and Royal Mail.